Corporate America has taken notice of the festival by setting up independent marketing operations during the festival. This has not pleased the Sundance Film Festival, who have tried various ways to encourage brands to officially sponsor the festival, instead of creating their own marketing event. The festival has also (controversially, in some circles) become a press event for celebrities. Attending the festival to see films can be difficult. For the 2008 festival, the film festival eliminated the $5 fee to register for a time slot to buy festival passes and ticket packages. This resulted in a flood of applications, and more than 4,000 were rejected without receiving any time slot at all. However, the festival then failed to sell all of the available passes and packages during the registration period, and added an open purchase period for all buyers. ^ The Associated Press (January 18, 2006). Sundance Mixed With Stars, Politicians. via Yahoo! News. Retrieved on 2007-11-11. ^ Sundance Mixed With Stars, Politicians. BAM. Retrieved on 2007-11-11. ^ Lauren David Peden (December 2005). Sundance Subdued. Freedom Orange County Information (coastmagazine.com). Retrieved on 2007-11-11. Sundance – A Festival Virgin's Guide - unofficial resources and information for festival attendees. Deconstructing Sundance - website using Bayesian analysis to predict how well films that play at the Festival will perform. 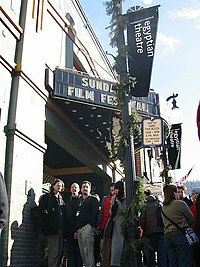 The winners of the 2001 Sundance Film Festival were announced in an awards ceremony January 27, 2001 in Park City, Utah. ..the 2001 edition of the Sundance Film Festival begins next week as the official kick-off to the film season, and one can feel the tension mounting as filmmakers, sales agents, distributors and PR agencies work against the clock to get their media campaigns ready for the big unveiling. Film laboratories are dealing with rush orders and last minute crises to deliver a literally wet film print for a world premiere showing. Nineteen years after the first Sundance Film Festival rose from the ashes of the tiny US Film Festival based in Salt Lake City, Robert Redford's little shindig in the Utah mountains has turned into the grand carnival of American independent film (whatever that means nowadays). There are more foreign films on hand this year than ever before, and despite premieres of such mainstream studio fare as "The Butterfly Effect" -- featuring Ashton Kutcher playing hopscotch with his past -- Sundance continues to be mostly about the singular vision of the lone filmmaker. Sundance is a place where wild cards flourish, though, and where the buzz tends to rise up around the least expected films.